Sometimes you need an interface right out of left field, something beyond mere HTML buttons and square grids. Enter Messages from the Past, a project born from the discovery of a childhood answering machine message tape. Above: not your traditional audio interface. All buttons are fully animated, and work exactly as their real-world counterparts do. 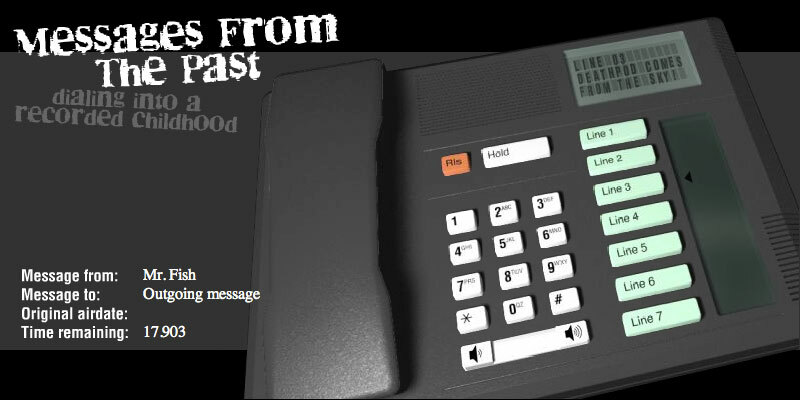 The number buttons produce DTMF tones that will actually dial a real phone. 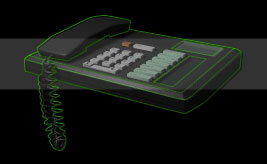 Featuring a fully 3D animated and interactive office phone, with live rocker buttons and animated shadows, this audio interface produces DTMF tones that can actually dial a real phone. Each Line button plays a different message from the original magnetic audio tape, the Release and Hold buttons pause or end playback, and the animated volume rocker switch adjusts the volume up or down. The dynamic LCD screen also displays data on each track being played. This is as close to a real office phone as you can get, and much more entertaining. This entry was posted on Thursday, October 27th, 2011 at 6:57 pm. It is filed under Visual Application Development and tagged with ActionScript 1.0, Adobe Flash MX, NewTek LightWave. You can follow any responses to this entry through the RSS 2.0 feed.